For those of you that haven't been keeping track of the Wii U release schedule, Pokkén Tournament is an upcoming fighting game based on Pokémon. It began life as an arcade game exclusive to Japan, but it was a logical choice to port it over to the Wii U. The arcade version features two screens for local multiplayer and it was initially unclear how (or if) multiplayer would carry over into the home console port, but the development team has thankfully found a way to make it happen. A listing on HORI's site for the Pokkén Tournament controller recently outed the existence of a local multiplayer mode. One player will be looking on the GamePad and one will be looking on the TV screen, ensuring that everyone gets a fair and equal view. It's an odd thought to consider that this wasn't previously confirmed, but nonetheless it's nice to see that this will be a game to break out when having a friend over. What do you think? 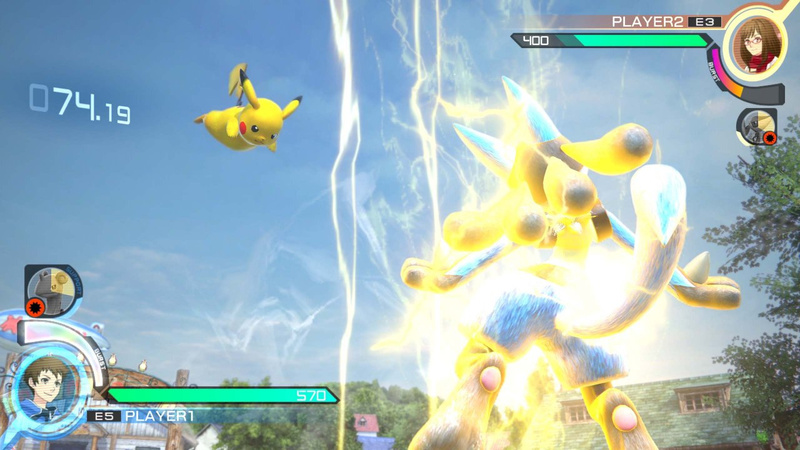 Will you be picking up Pokkén Tournament? What other features or modes would you like to see in this game? Share your thoughts in the comments below. That sounds... like a very desperate attempt to include local multiplayer. I really didn't think it'd be that big of a challenge to make this game work on one screen. I guess I don't mind, but it'd be pretty weird to not at least have the option of just split screen. With so many games being online multiplayer only though, I won't complain. "fair and equal view": one person seeing 480p on 7 inches, another seeing 720 on 50 inches. I would've liked it better to all be on one screen, mostly if this game were to have a tournament scene of some kind. Kinda disappointing, but oh well. @MitchVogel You might wanna add that Wii U Pro and the Classic Controller will also be available options. It'd help some people that didn't know prior such as myself (I just found out a few hours ago). game pad looks better in most games, hence why you look there over tv a lot, it's optimized for gaming and the colours on some tv's look off compared the game pad i notice. Of course Wii U Pro and Classic are options - there is a special pad going to be on sale for this game too. The stress of a Wii U fan: not even being able to take local 2 player for granted on an arcade fighter. I worry this will be another bare bones release, but it has heaps of potential. 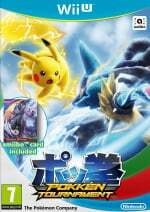 Pokken Tournament is going to be a day-1 purchase for me! So excited! Good opinion. Personally I think the Gamepad image looks horribly washed out, blurry, and low quality in general. It's serviceable at best, but becomes a challenge when you want to READ text on it. Maybe if it included more news... as in what other features would be in the game. @AVahne yeah it depends on the games i feel, like xenoblade nope i always use my tv, but for mario or others like it gamepad is fine. i hope if nx has a screen it's a higher rez one though. @NaturalGus for real. It's kind of like reporting news on a shooter that you can now aim your weapon. At first this seemed silly but simply looking at the header image explains why that was of some concern. This is how Hyrule warriors did local multiplayer. I'm the gamepad user too and I can't really offer a complaint about it. The lower definition is noticeable, but depending on how long your arms are and how close you sit to the TV normally I can assure that the screen size isn't an issue. Honestly though, I see no reason they couldn't include a split-screen option as well and leave it up to player preference. It's not like HW where split-screen would actually hinder both players. @hcfwesker @NaturalGus "The arcade version features two screens for local multiplayer and it was initially unclear how (or if) multiplayer would carry over into the home console port, but the development team has thankfully found a way to make it happen." I think the article is welcomed due to how they handled multiplayer for this game on arcades. It's nice to know how it's going down in consoles thanks to people knowing ahead of time and informing people, since it's kinda confusing. Don't really see the problem in that. Plus thanks to people talking about this now I know that it won't work like the Naruto Storm games for example, where both players could just play on the same 1 screen instead of needing separate screens over each player's shoulders. I personally wish it wouldn't be the way it's gonna be, but oh well. Seems bizarre for a fighting game to have split screen multiplayer, particularly to this absurd degree, but perhaps the style of gameplay justifies it. I guess we'll see once it is released. @NaturalGus I was kinda hesitant, too, but looking at the footage of it reveals that the camera tends to have a sort of over the shoulder perspective. That would be problematic trying to get that to work for two people on one screen; additionally, local multiplayer wasn't even confirmed prior to this. I miss the days that local multiplayer was a given and online was more of the "extra" or "maybe". Or at least include them both in games. My biggest complaint with games like Splatoon (which I love otherwise) is that I can't do much with my wife, friends, or family, yet I can play with some guy in Japan with no problems. I'm more of a face to face kind of guy, and enjoying games with people you care about. Ah, I can already see the next big announcement: "You can put Pokken Tournament into your WiiU - and play it!" To be quite honest with you, who didn't expect this? This is a fighting game after all and those mostly live from their local multiplayer. Now what would be far more interesting is whether there's an Online Multiplayer! Anyway, yes, I'm planning on getting this day-one, preordered at the local GameStop like pretty much every other game I buy these days. While I am not very fond of Pokémon spin-off games outside Snap this seems like an interesting concept that is more than worth trying out. EDIT: By god, I forgot about Pokémon Stadium! I love myself some Pokémon Stadium. If only it was released on VC! Very glad they are using the gamepad this way. I tend to play injustice like this as well, some how if I'm not using an arcade stick it helps me focus more. Ya but this isn't like every other fighting game. The arcades even had to have two separate units so each player got their over-the-shoulder view. Which is why Wii U is a perfect fit for Pokken Tournament. The two-screen dilemna is solved. Nice a good addition that should be included anyway in a fighting game (want that Pokken fight pad also lol). Hmm.... This could go wrong. I hear that Hyrule Warriors attempted this, and, well, let's just say there was some lag. I would love to see a story mode. That would probably compel me to buy this. Anyone know if a story mode is being included? A fighting game has a 2 player mode? Wow. It would be more newsworthy if it didn't have a multiplayer mode? ...or both players could just play on one screen like Naruto. I spent a lot of time playing that game multiplayer and it's really not problematic. It's pretty annoying they are forcing someone to play on a smaller, non-HD screen for no reason other than forced game pad implementation. @JaxonH I know but just imagine for a second a fighting game that does NOT offer even a local multiplayer. I doubt Nintendo would allow this for release unless it does have an online multiplayer instead of a local one (kinda like Splatoon). > Force player to watch stupid gamepad? Yes! Also, fair and equal view, my rear. Clearly the one who gets stuck with the gamepad is at a disadvantage. Most likely, the gamepad will be the worst possible controller option, so not only do you have a small screen but also a clunky controller. Yeah, no. This game is a port of an arcade game that uses two arcade cabinets two play multiplayer. Each screen changes in perspective depending on the situation, so yeah, you can't play local multiplayer on the same TV/screen as it's designed differently. Just be thankful we got local multiplayer with the gamepad + tv. Else it could be online only. That would require them to "remake" the game (which cost more time and money) to include split screen instead of porting it with slight changes. The game is design this way. I wish they'll include local multiplayer requiring two Wii Us and two TVs connected via LAN/WiFi though for tournament purposes not requiring internet. Yeah. Foolish of me to expect people who make video games for a living to put any amount of effort into porting a game to make it playable. My bad. @MitchVogel Since you are taking so much heat for this, and when I saw the article I thought it was written just for me, as I asked this questioned recently, I for one thank you. Probably a day 1 now, depending on the day. Though personally I can't play on the Gamepad too small and low res for me bu my sons and their friends will manage just fine to fight with Pokemon. @JaxonH @GoldenGamer88 "I know but just imagine for a second a fighting game that does NOT offer even a local multiplayer"
Godzilla on PS3 doesn't offer any multiplayer of any kind, which is kind of shocking as my kids and I spent many years playing 4 player Godzilla: Destroy All Monsters Melee on the Gamecube and Godzilla: Save the Earth on PS2 and Godzilla Unleashed on Wii - though we hated the controls on that one. Godzilla on PS4 does offer multiplayer, but it's online only, no offline multiplayer. I bought Godzilla on PS3 b/c it was on sale for $9. For $9 my kids have been taking turns having fun with it but it's normally a $50 game, $60 on PS4. @Fazermint Do you know how much effort they are putting into it? I just assumed it would have local multiplayer. Can't think of a fighting game which doesn't have. @Fazermint They did port it to a playable fashion...hence the gamepad view. The perspective of game is not the same as a traditional fighting game. As almost everyone else has mentioned even the arcade game has two screens. @Ryu_Niiyama You sure do swallow everything raw without questioning it. I'm going to assume you now have Xenoblade X. You really should get on that game. It's fast become my favorite RPG of all time. I'm on the final chapter- Level 56 and just bought a Lv. 50 Skell (cost like 10x more than the Lv. 30 Skells) and have all my probes chained together for optimal revenue (both credits and miranium). The two most powerful weapons in the game are the Pheonix and G-Buster. I got a Lv. 50 G-Buster on a rare drop in Sylvalum, but will probably have to buy a Lv. 50 Pheonix. Chapter 12 demands your skells be armed to the teeth, and there's no way I'm going in without both those weapons. You're gonna fall in love with the world SO MUCH. It's beautiful and awe-inspiring. Especially once you get the flight module and can see it from a vantage point. @wazlon This shows my age, but the arcade release of Yie Ar Kung Fu didn't have one. This is bitter sweet. On one hand it's mice to get local multiplayer, but on the other the Gamepad view, doesn't really go down with me. They could have made it like the Naruto Ninja Storm Games. I'll see when I get my hands on the game. So Nintendo fans not only get a new game for a system in it's last days, they get a damn good fighter (of which there are few on the system... AND it's Pokemon), they also (finally) get another game that is an excellent and logical use of the Gamepad demonstrating a system strength (split screen would NOT have been the same), and there's whining and complaints about it. I just don't understand... but if you don't get how an arcade game designed to be played with two SEPARATE screens would still need those two screens when it's brought home, then you really shouldn't comment. Period. Especially if it's insulting the developers when you have less that a clue how to code/port a game and have zero knowledge of the work that has already been put into the home version. Although, believe me when I say those offering their brilliant statements about how they could have made it split-screen easily are making me pee myself with laughter. Why don't you hop on one of their workstations and show them how it's done? Yeah. Thought so. @TTGlider someone hasn't played 2 player mode in Hyrule Warriors. Fair and equal view is a fair explanation for how such multilayer functions. @Fazermint you don't seem to understand the dual arcade cabinet functionality. They would have to reprogram everything to make it work split screen. My bet is they didn't intend a console release when they programmed it. Nobody is swallowing it whole. Your jumping on the hate train. No offense but why is this being used as a selling point? This is a standard for fighting games so I don't see the point of this news. They really should develop a way for local multiplayer to work that's offline tournament friendly, streamed tournaments are good promotion for the game and would be fun for Pokemon fans in general. Having one person play on the game pad will always favor the person using the larger television screen, and would discourage offline tournaments from taking place at all. In theory, you could have 2 Wii U's and the tournament matches take place in an online lobby that's password locked (assuming there even are open lobbies, as they were intentionally excluded from Smash), like how Starcraft 2 does it, but many fighting game tournaments don't have sufficient online for more than the stream, and if requiring online is the only way it could work it might be considered too much trouble, not even counting the likely requirement of 2 Wii U's per set up to begin with. Quite a few fighting game tournaments already provide 2 different monitors so opponents can sit across rather than next to each other, but they usually still run on one console per set up. So two players can't use Pro Controllers? Could've made it like Naruto Ultimate Ninja Storm. "Why is this news?" Lol because people were dumb enough to stir themselves into a panic that the WiiU would somehow skip local multiplayer. There was about as much chance of that, as there was of them porting this to the Wii. @mariovslink62 Because there was some obvious concern as to how they would port a game made to work with two separate screens to a home console that generally uses one. I would like to have a story mode, mini games mode, and a music/cutscene library mode in addition to the fighting/tournament mode. @Fazermint I doubt they were given enough money/time to make that kind of change. Blame the people funding the port, not the programmers. This was obviously the cheapest/easiest solution since very little changes had to be made to the original design. Excellent. Game pad view is perfect for me. Nice and personal. @Morph It should have not been said as a selling point. @Fazermint alternatively you question things in a childish manner regardless of the validity of your questions and condescend when literally everyone is telling you you're legitimately wrong... It's almost like you are commenting on something you know nothing about! Everyone complains. What's the problem? I had offline multiplayer granted for Need For Speed games too, until I played the recent Need for Speed: Most Wanted by Criterion. Don't take features for granted. In the future, Nintendo will release a Smash Bros. title without multiplayer but with killer lv. 999 figure players (amiibo). What's the hate for the Gamepad? It's not like you play your TV 30 centimeters (around 12.5 inches) afar, is it? That's the distance I play with the Gamepad from my eyes, it it looks great, no matter the 480p resolution, that looks great on a small screen. "One player will be looking on the GamePad and one will be looking on the TV screen, ensuring that everyone gets a fair and equal view." What this means though is that for local 2 player battles, one player is forced to use the gamepad, and subsequently that you cannot use two of the HORI controllers for this game when playing local battles. This is just awful optimization. While the extra viewpoint from the gamepad is actually smart use of the second screen, it should be an option, not a requirement, to use that controller, and the lack of support for two of the wired controllers is also a dumb move. @greengecko007 Wouldn't it be possible for them to allow an option to put the Gamepad on a stand while using another controller? Did they already say that wasn't possible? Is the game already out and everyone knows all of the features in it and I didn't know about it? I think we all should just wait for the game to come out or a Direct for giving more details near the launch of the title. Then we can start whining about good and bad features. "In this mode, Player 1 has to use the Wii U GamePad as their controller perspective on the GamePad indicating that Player 2 uses the TV screen as their perspective. You cannot use 2 of the HORI Pokkén Controllers to play the game in local multiplayer"
Sure, there are plenty of better ways to handle local multiplayer, that's why people are complaining. As for the wait and see approach, it may sound whiny, but I'd rather voice my complaints now and have them heard, even if they end up being moot as more information comes out and clears confusion, than the alternative, which is to simply remain silent and the game release in a crappy state. @greengecko007 No way! Giving both players their own screen, even if one is much smaller, is a much better option than cramming two viewpoints of the same battle on one screen! It's also a much better use of the Wii U GamePad than we normally get. So you can't use two Pokken controllers. The GamePad itself is still a very good controller option and is a small sacrifice to enable both players to have their own screen. Maybe they could provide a splitscreen option, but that would be very confusing and distracting for a dual viewpoint fighter compared to just playing on two different screens instead. @DarkKirby Sure, you could only stream from one viewpoint of the battles, but how does the TV give you a competitive advantage? Both viewpoints provide the exact same gameplay and view area. The only possible advantage that player could have is the ability to use one of the special Pokken controllers, but that can be neutralized by forcing him/her to use a Pro Controller instead. @Fazermint *shrugs * Or I'm realistic and have seen how the game works in the arcades. But if you want to be bitter for no reason be my guest. I've got my preorder already on lock. Can't wait for march! @BulbasaurusRex You don't absolutely need two render the game from two viewpoints. There are other 3D fighting games that work great with just one view. If the game really is unplayable for two people without doing two camera views, then that may also be telling of the game's quality. The gamepad providing a second view should be a bonus, not a means to force you to use it. It seems to me that it would have made much more sense to have only one camera perspective, with support for two wired controllers at once, and the ability to use the gamepad second screen as to offer a different view if you want that. @JaxonH Hey now, don't mess w/ Godzilla. Got my kids 4 movies on blu ray for Chrirtlmas and 2 more in my Amazon cart. And my kid was watching the original cartoon w/ baby Gadzooky last night. We are all about the Big G, and Gamera too. 4 hours into XCX so I'm more than a little behind you. Just signed up w/ the Reclaimers last night. It's slow going as my kids monopolize the tv all day and my kid had a friend sleep over Saturday night. Worst thing so far is certainly the tiny type, my wife and kids have been watching me play and they won't stop complaining about it. It's bad enough trying to read it myself - which I can't, even on my 52" screen, but listening to them go on and on and on, it's like somebody is constantly reading my NL posts out loud. Actually there are instances of using the game pad as a second screen while using a different controller. You don't necessarily have to use the game pad. That hasn't been confirmed as the only way to play. People are making such a fuss without considering what the game has been specifically designed to be. This is a different style of game than your average medium-wide shot fighting game (if that's what you seek, then by all means, stick to Smash, Mortal Kombat, Tekken etc.). This is game where perspective is key, as evidenced by the cover art for the physical release, and the fact that it requires 2 screens for local multiplayer, even in the arcade release. Yes, it strikes me as unusual too, but now I'm even more intrigued as to how this will be implemented, particularly as it is so unusual, and I've never played a fighting game in such a manner before. Perhaps they should at least support split-screen multiplayer, but judging from gameplay footage that I've seen so far, this game would not work as a single-screen experience in multiplayer. @Joenen The information straight from the official website currently does in fact lead us to believe that. There is the possibility of a translation error causing confusing, but I find it a bit of a stretch that a translator would make the logical leap that the gamepad offering a second viewpoint means you are required to use it as a controller, but rather that is what the website actually says. I'd have no problem being proven wrong though. To tell you the truth the gameplay looks similar to Naruto Ninja Storm and that works great with two people playing on a single TV. Eeeh why not just on one screen? Every single other fighting game has managed to do that. Though I suppose the bigger issue here is that one person is FORCED to use the gamepad as opposed to their controller of choice. Not ideal in many fighting games, some like controllers, some like fightpads, I would personally use an Arcade stick if it was an option (it isn't). Probably going to be a fun distraction with little to no competitive value as far as 3d fighters go. @greengecko007 @Senario You guys don't get it. The original arcade game is actually designed around two screens with two different viewpoints! The camera angle is from behind your fighter. They would have to completely redo the game in order to use a single viewpoint for the Wii U version. As for a splitscreen option, have you guys even thought about what that would look like for a dual perspective fighting game like this?! First of all, both players would be stuck with either an inadequate horizontal or vertical view, or they'd have tiny views with black borders. Then with the very nature of the game, it'd be full of confusion, disorientation, and maybe even some headaches trying to focus on your half of the screen. Forcing one player to use the GamePad is ultimately a small sacrifice in order to avoid all that nonsense. You can always use your arcade stick controllers in the single player and online modes. @BulbasaurusRex And? That hardly excuses the other issues with the controller configuration in a fighting game. Besides that it is only a slightly angled shot and honestly that is no excuse for forcing one player to be locked into a certain controller scheme. Every single fighting game nowadays has supported the basic controller, a fightpad, and an an arcade stick. This is preferred for a lot of fighting game players. When the fight pad is more or less a wider controller and you force the second player to play on the gamepad that is terribly inconsistent for making the game a good fighting game. Not to mention the lack of support for an arcade stick which I prefer to play as my hands start to hurt A LOT if I play on a controller. The only game where that doesn't happen on controller for me is Smash Melee, and that is after years of play to get used to it. I'd say it's essential for a fighting game to have local multiplayer. That said, I haven't goten around getting excited for this game. Maybe i'll see something worth my while closer to the release date. I surely hope so. Ah. Didn't see it in this article but it does appear on serebii. thats unfortunate that they outright said that. Smash brothers lets you use any controller you want even when you use the game pad as a screen so I don't see why prgrammere for this game couldn't do the same. Doesn't kill the game for me at all since there's not much a difference in controllers for me between classic and game pad, and I've never taken to sticks. It's just irksome that it's already been done before elsewhere yet not here. Hopefully someone pokes them about it. serebii does flub single words somewhat frequently from what I hear, but it's hard to mess up an entire sentence like this. Though it's important to note that the site specifies HORI controllers according to Serebii. Unless they're only listing HORI as an example, technically other controller options may be available. @Whopper744 fully agree! Love me some Splatoon, and it's fun bustung the game out, passing the gamepad aro7nd and introducing the game to friends, but...sometimes ya kinda just wanna play with or against those friends in the same room...touch screen features aside, I'm shocked Splatoon doesnt have at least 2-Player multiplayer outside of the balloon pop which I've yet to play. @BulbasaurusRex Since when does changing the camera angle require the whole game to be reworked? In fact, there are many times in the gameplay where it seems just fine to me to look at a single screen for both players. I haven't seen any footage that shows fights become unplayable for one player due to camera issues. I don't believe that the two screens in arcades was out of neccessity, but rather they thought it would be cool, which it is. Despite that though, that does not validate being forced to use the gamepad, and lack of support for two controllers, which they want people to actually buy. Forcing people to use certain controllers for a tournament is a poor idea and no fighting game tournament does that. The disadvantage to using the Wii U Gamepad as a screen as opposed to the larger television screen is it's easier to see what's happening on the larger screen as opposed to the smaller screen. You might not think it's significant but being able to notice and react to something on a significantly smaller screen is harder and does take longer than noticing and reacting to something on a much larger screen. Pokken isn't a Tekken clone, it looks like this. From what I understand there are battle modes which transition based on the attacks used, more traditional 2D combat when you are up close and more 3D movement combat when you are further away from each other. And there are no highs and lows, there is a rock, paper, scissor like system of attacks, blocking, grabs, and armored attacks. @DarkKirby I would like to add to your comment that the gamepad is wireless only. That is a huge problem for fighting games in general as wired controllers are almost always faster and more responsive. Every single type of typical controller for a fighting game has to be wired. Fight Pad is wired, Controller is wired variants, and the fight stick is also wired. @Senario @greengecko007 It's not just a slight angle change, and yes it would require reworking the game. The entire gameplay system is designed around those individual camera angles. They would have to completely revamp the gameplay to get it to work for a single camera view. You CAN use arcade sticks, either single player, online, or one of the players in local multiplayer. It's just that one of the players in local multiplayer has to use the GamePad. If you feel that strongly about using an arcade stick, give the GamePad to your friend to use. @DarkKirby That's a very minor disadvantage at worst, and forcing a Pro Controller (which is also wireless, thereby also negating that advantage) on the other player is better than giving him/her an unfair advantage. Deal with it. You can always do online-based tournaments, instead. Anyway, the fact remains that this is the ONLY viable means (no, splitscreen would be even worse) to get local multiplayer to work with this kind of game. It's better to have this imperfect setup than no local multiplayer at all. If you don't like it, play single player or online instead. @BulbasaurusRex And which arcade stick is available to be used might I ask? Cite your sources, Show me an arcade stick that is confirmed to work with pokken tournament. The only things confirmed to work with it are the standard controllers/gamepad and the one that comes with the arcade cabinet. And that one looks terrible and probably feels terrible to play on compared to a fight pad/arcade stick. Also, if it is one player's preference to play on arcade stick (In my case because I get terrible pains in my hands playing most fighting games on controllers) why must the other person be FORCED into using the gamepad? Not to mention they also may favor a fightstick as well. Is that not a problem? Traditional fighting games have standards and changing them up for the sake of changing them is simply irresponsible. You can be a fan of this game and defend it all you want but it is both legitimate criticism of this game's local multiplayer in a fighting game situation and a definite design flaw. Your arguments about it being an undeniable fact that there is no viable way to get local multiplayer totally ignores that any other fighting game only needs to render one view for both players on the same size screen with typically wired controllers of choice. EVERY SINGLE LEGITIMATE FIGHTING GAME DOES THIS. Honestly, I don't want the game to fail but it is giving me few reasons to support it personally besides "Hey look you can play a fighting game with pokemon now". This is great news and another great use of the GamePad much better than cramming two views into a split screen or rebalancing, designing and fundametnally changing the game for home use. Many of these comments are a new variety of misinformed spouting and/or whining I've never experienced on this site before! Happy new year!